Vice President, Prof. Yemi Osinbajo, SAN has said President Muhammadu Buhari is beginning to change the narrative and perception of leadership in Nigeria and Africa because of his widely acclaimed uprightness and honesty. 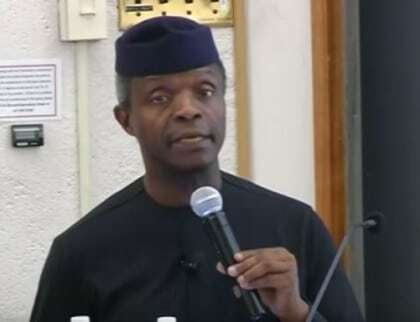 Osinbajo stated this while delivering a public lecture titled “The Unravelling of Boko Haram and the Rebuilding of the North-East of Nigeria’’ at the Harvard University’s Weatherhead Center for International Affairs on Thursday. Before he spoke, the Vice President had been received in the school by the Harvard University Marshall, Ms. Jackie O’Neil, and Prof. Jacob Olupona of the Divinity School among other top Harvard officials and professors. Osinbajo said the Buhari presidency offered Nigeria and indeed Africa the best opportunity to convince the entire world about leadership perception in the country and the continent. 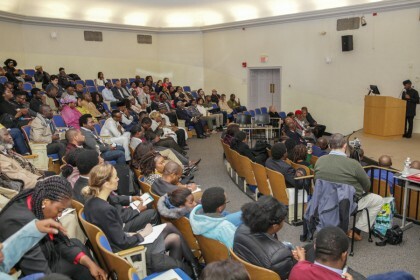 Prof. Osinbajo, who spoke on some of the causes of Nigeria’s security, social, political and economic challenges, noted that governance failure in the past culminated in the myriad of problems that manifested in the form of terrorism, kidnapping, general insecurity and many others that predated the Buhari government. On the Boko Haram insurgency, Prof. Osinbajo said the inability of previous governments to implement programmes and policies that had direct impact on poor Nigerians, and endemic corruption, led to a degeneration of the situation in the North-East. He however expressed optimism that the Buhari government’s posture and actions had changed the narrative for the better, stressing that the international community and Nigerians, including a few skeptics now believe in the government’s abilities to change things. He said: “Clearly one of the strongest reasons for President Buhari’s victory in the March 2015 Presidential election was the expectation that going by his reputation as a no-nonsense soldier he would defeat Boko Haram and restore peace to the North East. “He moved quickly to realise this objective, announcing a relocation of the Command and Control Headquarters to Maiduguri right at the heart of the insurgency. The Vice President told his audience that the Federal Government led by President Muhammadu Buhari remained committed to rebuilding the devastated North-eastern region through a comprehensive plan that is also transparent. He said the goals are to: “Restore peace, stability and civil Authority in the North-East region; co-ordinate the mobilization of targeted resources to respond to the humanitarian crisis and jump-start the region’s economies while strategically repositioning the region for long-term prosperity. “Providing equal access to basic services and infrastructure; promoting a civic culture that integrates zero tolerance to sexual and gender based violence with peaceful co-existence as the success indicator. “Accelerating equal access to quality education for girls as well as boys and building social cohesion; targeting social and economic development and capacity building that reduces the inequalities affecting the poor, particularly women and youth. Regarding treatment of abused women and girls, Prof. Osinbajo said despite the daunting challenge, the government in collaboration with local and foreign partners was establishing special programmes and shelters for abused women and girls. Citing the case of the recently released 21 Chibok girls and the teenage bomber that refused to blow up herself at the Dikwa IDP camp in February, VP Osinbajo said government had a strong commitment to impact on the lives of both the victims of the insurgency and other persons affected. He stressed the need for stakeholders to partner with government at all levels to counter the ideology of the insurgents as one of the measures of addressing the menace of terrorism. “After the trauma and deprivations of captivity on the day of their release they looked frightened, malnourished and unkempt. But such is the power of freedom that few days after their release, the girls were seen dancing and rejoicing heartily at a Thanksgiving service where their parents reunited with them for the first time in over two years! “What the stories of the Chibok girls and that of the converted suicide bomber point to is the certain defeat of Boko Haram insurgency and the waning resonance of its underpinning ideology. He said government however acknowledged the fact that the most important long term therapy was the assurance that the state has the capacity and the will to protect the most vulnerable. The Vice President concluded that the Federal Government’s commitment and strategy in combating Boko Haram and rebuilding the region was anchored on its anti-corruption posture which would ultimately ensure judicious utilization of resources for both the military’s operations and in implementing the non-kinetic aspect of reconstructing the north east.